2017 Meyer Products Path Pro 60"
Please call to verify Inventory on ALL Meyer Plow Equipment. Thank YoU! Performance: The Path Pro's 65-degree attack angle scrapes the surface more cleanly than standard straight blades. The highway plow-inspired flared wings scoop and funnel the snow faster and throw it farther than competitive brands. Angling Any Way You Want It: Only the Path Pro comes with automatic self-angling. Self-angling works by sensing which side of the plow is gathering the most snow (based on weight distribution), then automatically angles the blade in that direction. Or, if you prefer, simply pull the heavy-duty, spring-loaded handle to lock the plow in one of five different positions. View self-angling video. Reliability: When you’re used to making 800-pound snow plows for full-sized work trucks like we are, you tend to build things that can take a beating. That’s why though it’s small enough to accommodate your ZTR, the Path Pro is no wimp. It’s made of 14-gauge, high-tensile steel and features a heavy-duty push frame, trip springs and grease zerks. The universal mount is forged of dual-walled tubular steel, and is sealed in a rust resistant, high-strength coating. 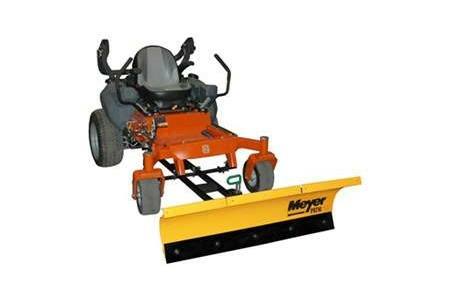 Stronger By Design: The Meyer Path Pro is stronger at critical stress areas than competitive plows. When stress-tested against the other guys, the Path Pro stands up where others show weakness, but is still lightweight. Ease of Use: Use the existing ZTR mower deck foot pedal to raise and lower the Path Pro. Universal Mounting System…For Any Kind of ZTR: The Path Pro comes with brackets that will allow you to easily and securely attach it to just about any ZTR. The brackets are also designed to provide you maximum ground clearance once the plow is attached. Compatibility: The Path Pro fits the biggest names in the ZTR business, so take your ZTR to the next snow-destroying level.